No sun? Try container gardening in shade. Too much shade is a challenge to lots of gardeners and I am no exception. Over the years, my yard has changed from a mostly sunny area to a shady one due to the maturing of trees. I have had to move perennials from one area to another to keep up. Grass has proven to be difficult to grow in the shade and so have many perennial flowers. Also, as the trees have grown, their roots have grown too and the ground is harder to work around them. The solution – container gardening in shade. Container gardening in the shade has benefits. For one thing, your pots won’t dry out as quickly as they do in the sun, so watering them is not as much of a chore. There’s no competition from tree roots as I mentioned above. And finally, it offers the opportunity to grow a whole new range of flowers and foliage plants that you can’t grow in your areas of full sun. 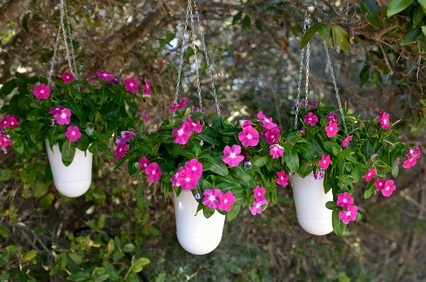 Hang pots directly from tree branches – add color in the shade. In my shady yard, I hang flowering baskets from the tree branches (below) and arrange pots and boxes underneath. I also have an area that slopes slightly and was difficult for me to mow. I have used mulch, rock and groundcover to create an area that requires no mowing. For color, form and texture, I use containers with differing foliage, adding flowering plants as they are available. Hostas, nettle, coral bells, and grasses are my perennial staples. I use impatiens, fuchsia, coleus, and begonias as floral accents in warm weather. It is one of the nicest corners of my yard. 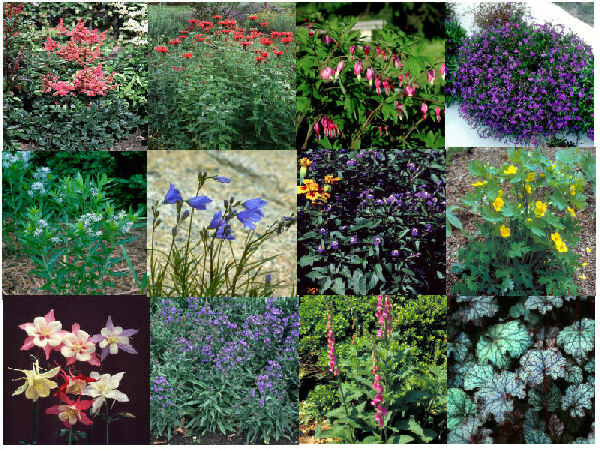 There are less flowering plants that grow well in shade than there are for sun, but there are hosts of foliage plants with different colors and textures that are beautiful too. Before you choose shade plants for container gardens, pay attention to see how much, if any, sun your outdoor areas actually receive. You may be surprised how much partial or filtered sun your seemingly shady area receives. If your outdoor areas get 2-4 hours of dappled or direct sun per day, plants that indicate partial sun-shade requirements will work for you. To lighten corners of shady areas, use white or light colored flowering or foliage plants in your container gardens. Hostas – one of my favorites. Above are hostas – a really versatile perennial foliage plant. They come in a huge variety of sizes, colors and textures. 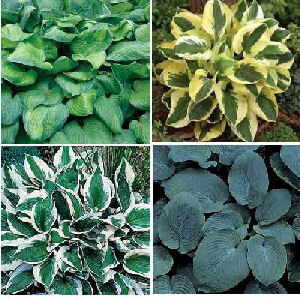 Here, from top left and clockwise, is hosta “guacamole”, “brim cup”, “elegans” and “patriot”. To find plant varieties for container gardening in shade in your specific growing area, visit garden.org. The National Gardening Association has a Plant Finder that is easy to use and a great resource.